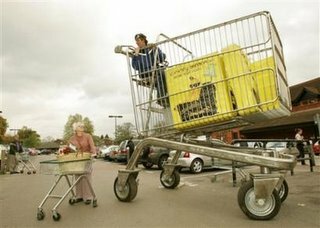 "This photo supplied by Guinness World Records shows Edd China talking to a shopper while driving his way into Guinness World Records book in Henley-upon-Thames, England,Tuesday, Nov. 8, 2005, after engineering what the book calls the largest motorized shopping cart in the world. The 11.4 feet tall, 9.8 feet long and 5.9 feet wide cart was created to celebrate the book's self-proclaimed first ever Guinness World Records Day on Wednesday Nov. 9, 2005. Edd is also currently featured in the Guinness World Records 2006 edition book for his record for the World's Fastest Sofa. (AP Photo/Guinness World Records/Tim Anderson) "
November 14, 2005 by Carol.